Creamy or firm when cooked, yams have an earthy, hardy taste and usually a minimal amount of sweetness. Although they are available throughout the year their season runs from October through December when they are at their best. There are approximately 200 different varieties of yams with flesh colors varying from white to ivory to yellow to purple while their thick skin comes in white, pink or brownish-black . Their shape is long and cylindrical (oftentimes having offshoots referred to as "toes") while their exterior texture is rough and scaly. There is great confusion between yams and sweet potatoes in the United States; most of the vegetables labeled "yams" in the markets are really orange-colored sweet potatoes. Yams are a good source of vitamin B6. Vitamin B6 is needed by the body to break down a substance called homocysteine, which can directly damage blood vessel walls. Individuals who suffer a heart attack despite having normal or even low cholesterol levels are often found to have high levels of homocysteine. Since high homocysteine levels are signficantly associated with increased risk of heart attack and stroke, having a good supply of vitamin B6 on hand makes a great deal of sense. High intakes of vitamin B6 have also been shown to reduce the risk of heart disease. Yams are a good source of potassium, a mineral that helps to control blood pressure. Since many people not only do not eat enough fruits and vegetables, but also consume high amounts of sodium as salt is frequently added to processed foods, they may be deficient in potassium. Low intake of potassium-rich foods, especially when coupled with a high intake of sodium, can lead to hypertension. In the Dietary Approaches to Stop Hypertension (DASH) study, one group ate servings of fruits and vegetables in place of snacks and sweets, and also ate low-fat dairy food. This diet delivered more potassium, magnesium and calcium. Another group ate a "usual" diet low in fruits and vegetables with a fat content like that found in the average American Diet. After eight weeks, the group that ate the enhanced diet lowered their blood pressure by an average of 5.5 points (systolic) over 3.0 points (diastolic). Dioscorin, a storage protein contained in yam, may also be of benefit to certain individuals with hypertension. Preliminary research suggests that dioscorin can inhibit angiotensin converting enzyme, which would therefore lead to increased kidney blood flow and reduced blood pressure. Many consumers have found products in the marketplace that promote wild yam or wild yam extracts as substances that can help provide a natural alternative to hormonal replacement in women who have reached the age of menopause. Many of these products are provided in the form of creams that can be topically applied. Even though the food itself is not usually promoted by natural products companies, these yam-containing products have sparked interest in the relationship between yam and menopause. Yams do contain some unique substances called steroidal saponins, and among these substances are chemicals called diosgenins. Because of similiarities between diosgenin and progesterone, questions were initially raised about the ability of our body to convert diosgenin into progesterone, but research has shown that the answer here is clearly no. Diosgenin does, however, have an impact on hormonal patterns in studies involving animals, and may be helpful in lowering risk of osteoporosis, although we don't as yet have any human studies in this area. Wild yam also has some history of traditional use in herbal medicine, especially Chinese herbal medicine, as a botanical that can affect organ system function. While the focus here has been on kidney function, wild yam (or Chinese yam) has also been used to support the female endocrine system. For example, there has been traditional use of this root in conjunction with lactation. We've only seen one high-quality, peer-reviewed research study in which women were actually given wild yam (in the form of a topical cream) to determine the impact of this plant on menopausal symptoms. Although this research showed some very limited benefits from the wild yam cream—and no side effects—none of the symptom changes were statistically significant. In summary, we'd say that there's no research evidence to support the claim that yam has special benefits when it comes to menopause, but that more research is needed in this area because there is a clear connection between yam, diosgenin, and endocrine function that is not yet understood. We'd also like to add some information about yam and vitamin B6. Vitamin B6 has been an especially popular supplement with respect to premenstrual syndrome (PMS) in women, especially in conjunction with the depression that can be triggered by PMS. Some companies have also advocated the use of this vitamin for menopausal symptoms. One cup of baked cubed yam contains 15.5% of the Daily Value for B6, and we rank yam as a "good" source of vitamin B6 for this reason. In research studies, however, the dose of vitamin B6 required for help with PMS depression is about 50-100 milligrams—many, many times the Daily Value level of 2.0 milligrams. So if you're a woman, even though yam might be a food well-worth including in your meal plan in conjunction with PMS, the amount of vitamin B6 that you'd be getting from this food would be insufficient (by itself) to reach the therapeutic level shown to be helpful in research studies. Yams' complex carbohydrates and fiber deliver the goods gradually, slowing the rate at which their sugars are released and absorbed into the bloodstream. In addition, because they're rich in fiber, yams fill you up without filling out your hips and waistline. And one more benefit, yams are a good source of manganese, a trace mineral that helps with carbohydrate metabolism and is a cofactor in a number of enzymes important in energy production and antioxidant defenses. You've just got to hand it to Mother Nature; when She brings forth a food, She makes sure it integrates everything needed to contribute to your health and vitality. Yams are members of the Dioscoreae family. Depending upon the yam variety, of which there are about 200, its flesh may be of varying colors including white, ivory, yellow or purple while its thick skin may either be white, pink or brownish-black. Their shape is long and cylindrical (oftentimes having offshoots referred to as "toes") while their exterior texture is rough and scaly. Yams have a very starchy and slippery texture and when cooked, will either be creamy or firm, depending upon the variety. Their taste is earthy and hardy, with most varieties having minimal, if any, sweetness. Specific types of yams include Dioscorea alata (Hawaiian yam), Dioscorea batatas (korean yam) and Dioscorea esculenta (sweet yam). Chances are this does not sound like the description of the "yams" that you had for Thanksgiving dinner. That is because most of the vegetables that are labeled "yams" in the United States are really orange-colored sweet potatoes. When the moist-fleshed orange-colored sweet potato was introduced into the United States in the mid-20th century, producers wanted to distinguish it from the white-fleshed sweet potato that most people were used to. They adopted the word "yam" from "nyami", the African word for the root of the Dioscoreae genus of plants. While there are attempts to distinguish between the two, such as the U.S. Deparment of Agriculture's labeling requirement that the moist-fleshed, orange-colored sweet potatoes that are labeled as "yams" also be accompanied by the label "sweet potato", for many people this does not help to clarify the distinction between the two very different root vegetables. Yet, once you experience the distinct taste and texture of the real yam you will definitely know the difference, appreciating each of these root vegetables for their unique qualities. Although it is uncertain from which country yams originated, yams are one of the oldest food plants known. They have been cultivated since 50,000 BC in Africa and Asia. In addition to these continents, yams also currently grow in the tropical and subtropical regions of North and South America. Yams are one of the most popular and widely consumed foods in the world. They play a staple role in the diets of many different countries, notably those in South America, Africa, the Pacific Islands, and the West Indies. As noted in the Description section, oftentimes the root vegetable that is labeled in the store's produce section as a yam is not truly a yam but is a variety of sweet potato. Therefore, if you want to buy a real yam, you should ask someone in your store's produce department who can let you know the actual origin of the vegetable in question. As yams are not widely available in the United States, you may find that your store does not carry true yams although you are certain to find them in many Asian and African food markets. Choose yams that are firm and do not have any cracks, bruises or soft spots. Avoid those that are displayed in the refrigerated section of the produce department since cold temperature negatively alters their taste. Yams should be stored in a cool, dark and well-ventilated place where they will keep fresh for up to ten days. They should be stored loose and not kept in a plastic bag. Keep them out of exposure to sunlight or temperatures above 60°F (around 15°C) since this will cause them to sprout or ferment. Uncooked yams should not be kept in the refrigerator. Purée cooked yam with a little milk and season with tamari, coriander, cumin and cayenne. As yam has an earthy, deep taste, it nicely complements darker meats such as venison. Add chunks of yams to your next stir fry or pan of roasted vegetables. Roasted yams, fennel, onions, and mushrooms are a delicious combination. Yams are a good source of dietary fiber, potassium, vitamin C, manganese and vitamin B6. In addition to the nutrients highlighted in our ratings chart, an in-depth nutritional profile for Yams is also available. This profile includes information on a full array of nutrients, including carbohydrates, sugar, soluble and insoluble fiber, sodium, vitamins, minerals, fatty acids, amino acids and more. The following chart shows the nutrients for which this food is either an excellent, very good or good source. Next to the nutrient name you will find the following information: the amount of the nutrient that is included in the noted serving of this food; the %Daily Value (DV) that that amount represents; the nutrient density rating; and the food's World's Healthiest Foods Rating. Underneath the chart is a table that summarizes how the ratings were devised. 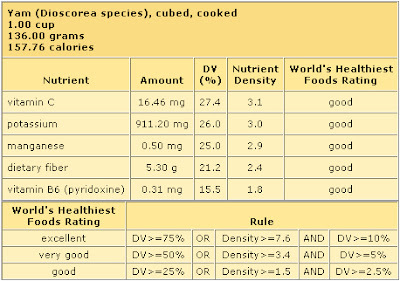 Read detailed information on our Food and Recipe Rating System. Hsu FL, Lin YH, Lee MH et al. Both dioscorin, the tuber storage protein of yam (Dioscorea alata cv. Tainong No. 1), and its peptic hydrolysates exhibited angiotensin converting enzyme inhibitory activities. J Agric Food Chem 2002 Oct 9;50(21):6109-13 2002. Moalic S, Liagre B, Corbiere C, et al. A plant steroid, diosgenin, induces apoptosis, cell cycle arrest and COX activity in osteosarcoma cells. FEBS Lett 2001 Oct 12;506(3):225-30 2001.